The Best Tool Chest for Your Collection! A place for everything and everything in its place – that’s one way to prevent your tools from getting misplaced. Today, we will talk about why you should invest in a good tool chest. Today, we talk about why you should invest in a good tool chest. We’ll also list down several products to find which could be the best tool chest for you! Multiple forms of storage capacity; has an outlet for your electric tools. Tool Chest vs. Tool Box: Which One Is For You? It is not enough to have your own system in your work area when it comes to owning and organizing your tool collection. If your garage is humid or your location makes humidity unavoidable, you expose your tools to rusting by leaving them out. 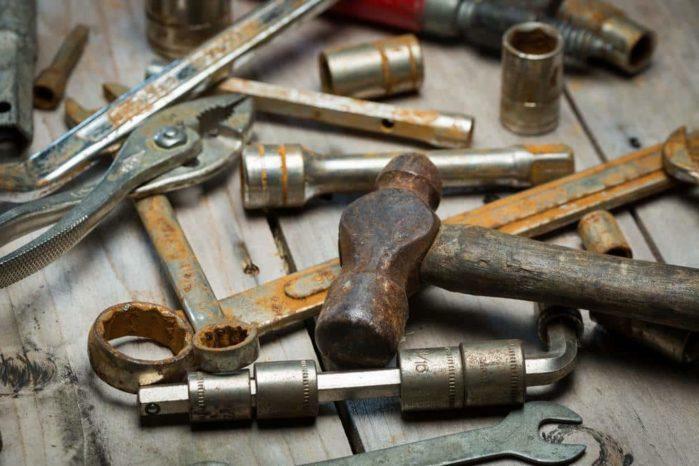 Rusting damages the quality of your tools, making them more likely to break. It will take time, money, and effort to replace or repair damaged tools. If maintained properly, rusting will take a while and your tools stay clean and efficient. Prevent your tools from rusting too fast by organizing them in appropriate storage containers. But if your area is too humid even with storage space, try investing in silica﻿ gel﻿ pa﻿ckets for your storage. When looking for tool storage, you will come across two similar products: tool chests and tool boxes. Some sellers use the term interchangeably. Modern models have adapted the best parts of both, but traditionally, these are different. A tool box is a classic storage option. It’s usually made of steel or hard plastic and has detachable inner compartments for tools like nails. It’s for the simple storage for household use or a portable box for the working man’s everyday tools. A tool chest, however, is usually larger and more heavy duty. Some tool chests have detachable top chests you can carry and bottom cabinets you roll. A regular tool chest should be big enough to hold larger power﻿﻿ tools tool boxes can’t carry. Basic tool chests can have a few drawers and a lock. Higher-end tool chests include drawers of varying sizes, pegboards, security features, and even an outlet for electric tools. If you only need to organize a few tools at home which you infrequently use, a toolbox would be more appropriate. But if you’re a regular craftsman who takes his tool collection seriously, opt for a larger tool chest. There are many models available online or in your nearest hardware store. Prices range from hundreds to thousands of dollars, so it helps knowing what you are looking for in a tool chest. If you’re on a budget, avoid cheap tool chests with low-quality steel that can easily dent. There are quality tool chests, though don’t expect nothing more than basic storage. Higher-end tool chests usually have reinforced steel and extra utility features. Although expensive, higher-end tool chests usually have reinforced steel for long-term durability. It also has features that do more than just store tools in drawers. If you want to store your tools close by, some offer peg boards or top lids for easy access. Moreover, these chests have different kinds of drawers and storing methods. If you have or see yourself having a big collection of tools, opt for bigger volume chests. Also choose chests with bigger and deeper shelves for larger tools. Whether working in a profession that needs tools or organizing your﻿﻿ ﻿workbench at home, portability is important to consider. Choose between a chest you can carry or one you can roll around. Check the material’s strength. Lower-priced chests are made of weaker metals and brittle wheels while more expensive tool chests are made of stronger, durable materials. If you live in a humid location, opt for a stainless steel chest. Make sure the chest you are buying does not already have rust. Do not buy chests with dents because these are either worn out or easily broken. Overall, make sure your tool chest is in good condition, is portable, and has enough volume to fit your tool collection. Now that you know the important parts of getting your own tool chest, here are our top five picks for tool chests! The Excel TB2105-X is the top detachable chest of a 3-part set. It is compatible intermediate and roller cabinet, the TB2502-X and the TB2605-X, which are sold separately. It weighs 51 lbs and can support up to 50 lbs worth of tools. In addition, It is made of scratch-resistant and durable steel with aluminum drawer pulls for its five ball bearing slide drawers. It also has two side handles and a lock with two keys provided. It is a much larger toolbox. This is good if you want something bigger than a toolbox but not too much space. It is sold separately from its set. It is relatively heavy to carry. Its net weight is 51 lbs and can support up to 50lbs, so you would be carrying a maximum of 101 lbs during transportation. It is only a part of a complete tool chest set. This is a con if you want all the features of a tool chest. This heavy duty tool chest from Milwaukee has two parts: a top tool chest and a bottom rolling cabinet. It weighs 400 lbs and has over 27,000 cubic inches of available space and can support up to 1,800 lbs. Its top lid has a pegboard and 10.5” height for vertical storage for your power tools, It features a pull-out workspace drawer, industrial-grade polypropylene casters, and a reinforced angle-iron base for durability. Includes a power outlet and charger. It is big enough for large tool collections. It has the space and multiple storage options to accommodate large tools. Its steel and multiple features make it a good choice for those in commercial garages, not just home users. Its wheels do not provide a lock. Peg board might not fit all tools. Its peg board may not fit larger tools, which can be placed in the bottom compartment instead. This Seville tool chest is on the shorter side of rolling tool chests, standing at approximately 30”. It weighs 110 lbs. Its hardwood top can serve as working space with convenient reach for your tools. It features 4 5” castor wheels which you can lock into place as well as a chrome push bar for easy movement. It has 6 cushion-lined drawers that can carry up to 30 lbs each. Its bottom drawer is 10” deep for your larger tools. It has 1 key for all your drawers. It can double as a working space. This is convenient if you don’t have a workbench or want to work close to your tools. If you’re looking for heavy duty tool chests with the basics but still good quality, this is the choice for you. It comes with easy to understand assembly instructions. Users estimate a 2-3 hour setup time. Assembly includes installing screws, so you need someone capable. It is not stainless steel. This makes it prone to rusting in humid environments, and could potentially affect your tools as well. This Craftsman tool chest is slightly bigger than the average toolbox. It has the convenient top handle of a toolbox and drawers found in tool chests. It weighs 19.4lbs and has a 2” depth per drawer and a 2.5” depth at the top lid. Unlike bigger chests, this one can be carried around and offers the portability of toolboxes. A hasp and staple as well as draw bolt latches for security measures. The upper lid must also be opened before opening the drawers. It lacks the room for larger tools that other chests have. It does not come with a lock. You must provide your own lock if you want it secured. Smartxchoices’ 57.5 lbs tool chest has two parts: the upper detachable tool chest and the lower roller cabinet. It has ten drawers of varying sizes, trays, and a pegboard on the side for your hanging storage needs. The set is portable with its sidebar handle and omni-directional wheels that can be locked into place. It is both durable and secure and can absorb the tools’ oil with its EVA lining. It also comes with a one-year warranty. Very secure.It has a lock system where the upper lid needs to be opened before you can open the upper drawers. Durable. It is made of heavy duty steel and powder-coated paint that prevents scratches and rust.Its EVA foam absorbs the oil and humidity on your tools as well. Its EVA foam absorbs the oil and humidity on your tools as well. It requires assembly. Assembly on products like these may affect the overall performance of the tool chest. Only the top part is protected by its lock. The lock opened by the top lid does not work with the lower half. For this list, we’re looking for the best tool chest that has the most to offer for the least setback. While some have similar features, we’re looking for the differences that make the tool chest stand out. The title of best tool chest goes to the Smartxchoices 24-Inch tool chest. It has the best features and volume capacity that can suit all types of users. In addition, it is not the biggest, but it provides more than enough space for any regular tool collection. It also wins for its EVA foam lining. The chest itself not only protects your tools from elements and organizes it for your needs, but it also absorbs the oil residue from your tools. Whichever you choose, always remember maintaining your tool chest properly will help prolong its quality and the features you need. Do not load it beyond its maximum weight limit. Good luck and be sure to let us know your thoughts by leaving a comment below!